1. Preheat oven to 220°/Gas 7. 2. Heat olive oil in a pan and add the peppers, roast until soft. Add the sliced mushrooms and onions and cook until caramelised. 3. Add the garlic and thyme, cook briefly then add the wine. Simmer for 5 minutes. Season and allow to cool. 4. Roll out the pastry, place on a lined baking tray. Cut off three 1cm strips to use for decoration. 5. Spread the cooled mixture on half the pastry and fold the pastry over to cover. Seal edges and decorate with pastry strips or star shapes. 6. Bake for 30 minutes until golden. 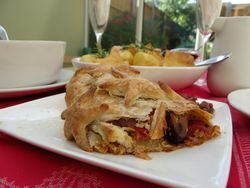 For details of cookery classes and parties see www.ourlizzy.com or contact Lizzy on 01684 892 688. Lizzy also offers tailor made cookery sessions.